The Rim Rock Nature Trail is located within the South Rim section of the Black Canyon of the Gunnison National Park. The trail has 3 trailheads with one at the Visitor Center and another near the mid point at the Tomichi Point Overlook and the third one is at the campground. This is one of the only trails in the South Rim section of the park that allows dogs. The trailhead at the Visitor Center is at the south end of the parking area. If you follow the sidewalk along the split rail fence towards the south entrance to the parking area then you can't miss it. While the trail runs along the top of the rim it does stay at a safe distance from the edge. There are numerous spots where you can walk right up to the edge of the cliffs and peer down into the canyon. At some places you can see all the way down to the Gunnison River. At just over a quarter mile the trail passes beneath the Tomichi Point Overlook. There is another restroom in the parking area. If you don't have a trail guide for the nature section of the trail you can pick one up at the Tomichi Point trailhead. The guides come in handy if you would like to learn about some of the plants in the area and a little bit about the geology. At about the 4 tenths of a mile point of the hike there is another trail that branches off toward the canyon. 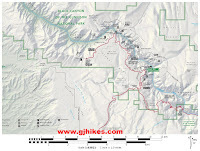 This is the Tomichi Point inner canyon trail and a permit is required to hike it. Permits can be obtained for free from the Visitor Center. You can find more information on their website about the inner canyon hiking trails. At the 8 tenths of a mile point of the hike the trail is met by the Uplands Trail which takes a different route to the Visitor Center. Dusky Grouse are usually hanging out somewhere around the campground end of the trail. They aren't always out where you can see them but you can occasionally hear them calling to each other somewhere in the oak brush. They really know how to strut their stuff. It is also even more common to see deer browsing around the campgrounds. At night you might be awoken by the sound of deer walking through your camp or the yipping of a coyote somewhere nearby. If you are camping you will want to keep all candy and food locked away in your car or in one of the bear lockers or you might get woken up by something else. A person should be careful with other things also like where you spit your toothpaste or spilling grease or marshmallows around the campfire. Bears can smell food items and smelly things like soap from long distances. The Rim Rock Nature Trail offers some spectacular views of the Black Canyon that are constantly changing as the sun passes over casting shadows that partially conceal sections of the canyon while seemingly casting a spotlight on other portions making them to look more prominent. The Rim Rock Nature Trial is most popular with campers. Many of them can be seen walking their dogs along the section between the campground and Tomichi Point. And one thing that is especially nice is that either they are cleaning up after their pets 100% or someone else is. 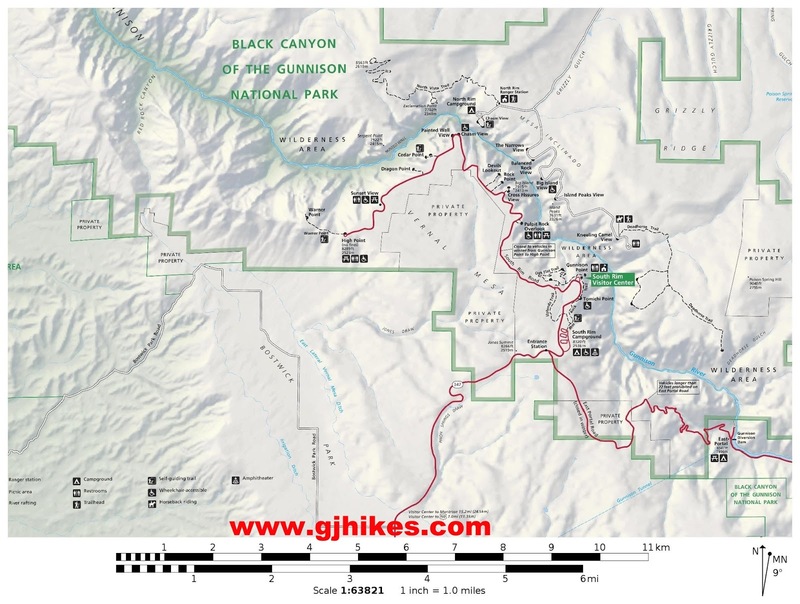 There are so many nice trails to hike in the Black Canyon of the Gunnison National Park but if you can make the time you probably won't be disappointed with this one. If you would like to see it for yourself then all you have to do is 'Take a hike'.